I’ve never really been a skincare addict or a makeup snob. I’ve got a pretty basic, quick makeup routine that works for me, even if we only have 10 minutes before we’re late to pre-school in the mornings. However, as I edge ever closer to 40, I’ve become more worried about looking older. Makeup can only do so much, so I started looking into a skin care routine that I could actually stick with, even after 10-12 hours with kids + laundry + cooking + errands + work. I definitely didn’t want to invest a whole bunch of money in products that would only sit in my bathroom gathering dust. Mostly I want to take better care of my skin after majorly neglecting it these past few years while I have been focused on babies. After lots of research (aka reading endless Amazon reviews), I narrowed my list down a few products that are already making a difference in how my skin looks. I have large pores and my skin has been looking pretty dull and tired. After two weeks of consistent use, I’m quite happy with the progress I’ve seen! Honestly, I’ve relied on makeup remover wipes for years up to this point. They seemed to get the job done quickly and efficiently, but I never did feel like my face was super clean. 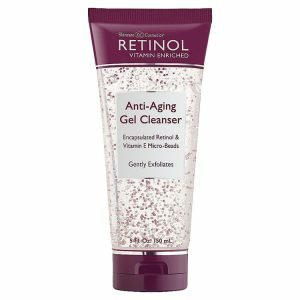 I found this Skincare Cosmetics anti-aging gel cleaner with retinol at TJ Maxx and decided to give it a shot. It only takes a tiny bit to take off your makeup and leave your face feeling refreshed. It has little retinol microbeads that gently exfoliate as you wash. I think it was about $6 and I will definitely purchase again. I only use it at night, but it’s gentle enough to be used twice a day. 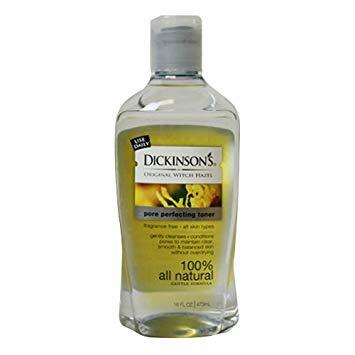 My skin has a tendency to be a little uneven and this toner has worked wonders! I pour a little on a large cotton ball and swab it all over my face in the morning after I wake up and at night after a shower. It’s cooling and gentle and I like how it dries quickly. It was about $4 at H-E-B. I’ve also been using a Sephora sample of the CAUDALIE serum, which is considerably more expensive. The reviews are mostly good, but I’m not sure at this point if I can justify the cost. It’s $79 online, but it could be a little cheaper at Sephora or Ulta. If you’re anything like me and you’ve never invested much time or money into skin care, this is probably a step you might consider skipping. I always assumed eye cream was for old ladies and that it was an indulgent and excessive step… but I was so wrong. After years of being up all hours of the night with my daughters, I had dark circles under my eyes that I would try to hide daily with concealer. 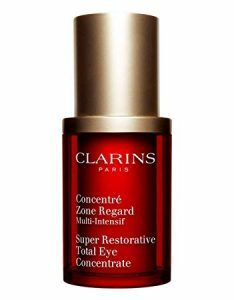 Then I stumbled upon this Clarins Super Restorative Total Eye Concentrate. Supposedly, it can actually improve that tender skin under your eyes by lightening and brighting it, on top of adding a little tightness. I was definitely doubtful – all of that sounded too good to be true. I’ve hated how tired I look (even when I get to sleep all night!) for quite some time, but I figured it was just part of motherhood. This stuff, though, has made a noticeable difference in just a couple of weeks! I use a pea-sized amount under both eyes at night. While I’m still using my concealer in the mornings for now, I’ve got my fingers crossed that my dark circles will fade with regular use. The only drawback is this is a pricey little miracle in a bottle – its $85 at Ulta. On the plus side, you need so little per use that the bottle will likely last several months. My favorite part of my evening skin care routine is this Formula 10.o.6 PM Perfector moisturizer – it smells absolutely heavenly! The smell doesn’t last long once you apply it, though… in fact, it’s there just long enough for you to love the scent and then it’s gone! 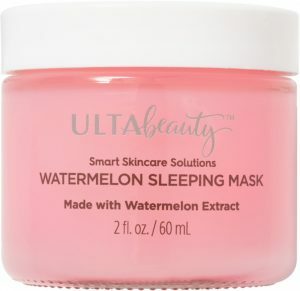 It’s intended to brighten, hydrate and smooth your skin while you sleep. It doesn’t leave a greasy residue behind and soaks in quickly. It was $9 at Ulta and I will definitely purchase it again. This heavenly little bottle smells just like a watermelon jolly rancher. It glides on easily and instantly makes my face feel cool and refreshed. Because it’s a gel-like consistency (as opposed to a cream), you need very little with each application. Its purpose is to lock in moisture while you sleep, helping your skin look more revitalized in the morning. 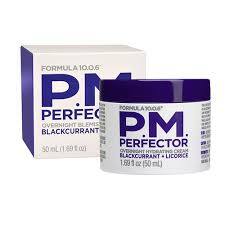 I apply this about 15 minutes after the PM Perfector moisturizer, usually while I am reading in bed. I haven’t had any trouble with it staining my pillowcase or coming off when I lay down. It’s $16 at Ulta, but I paid about $13 after applying a 20% off coupon. It’s on my must-have list forever! So after 14 days of sticking to this routine every night, my pores look smaller and my skin looks much brighter and healthier. From start to finish, the entire routine takes about 30 minutes, assuming I use the gel cleanser in the shower. It feels good to take better care of myself after all these years of not caring for my skin. I’m hopeful that a consistent routine will keep me looking like I’m in my 30s for several more years! I absolutely understand why friends have encouraged me for years to find a skin care routine that works. My skin has visibly improved after taking a little extra time to pamper myself. Also, I’m thankful I found a few of these items at TJ Maxx, which cut down on the cost a bit. Not including the pricey Clarins eye cream, the total came to about $45 altogether. I might try out a few other toners, but overall I plan to repurchase everything else. If you’re a super busy mama with babies and toddlers and these six steps seem a little excessive, I would start with a cleanser + toner + moisturizer. You can easily make time for just those three things in five minutes. You should see an improvement in how your skin looks, especially if you’re current skin care routine includes remembering to shower every 2-3 days! We’ve all been there – it’s just part of life with a baby! Pregnant mamas might want to take extra care before trying anything new in case your face is a little sensitive due to pregnancy. This might be true for post-partum mamas with a newborn, too – those hormones can do crazy things! What’s your current skin care routine? Share your favorite products below – I’m open to trying new things! I specialize in maternity, Fresh 48 at-home newborn and breastfeeding mini sessions in The Woodlands, Texas. A luxury photography experience is the perfect way to celebrate that perfect baby bump and your adorable newborn. If you’re ready to chat about a magical photo session celebrating you and your baby, click the button below to get started!